There was no doubt that man-for-man, Spain was the best team in the World Cup 2010. However, by the time I came to watch their quarter-final clash with Paraguay in Bloomsbury’s stylish new Pinchito Tapas restaurant, they had, a couple of David Villa goals aside, hardly set the world alight. Their previous four games in the tournament, beginning with that unceremonious opening game defeat to the unfancied Swiss, had seen them score an unremarkable five goals and progress to the last eight in a steady, but markedly unspectacular way. Their quarter-final opponents, however, had thus far made the Iberian outfit look positively rampant. Paraguay had squirmed their way through the group stage as one of the most negative, defensive teams in the tournament, scoring a meagre three goals in their four previous games (the same number as England, an indication of how bad they were), and winning fewer fans than Emile Heskey has outside of the England management team. Indeed, there was no one who sat through their coma-inducing no-score bore draw with the Japanese in the previous round who wasn’t left asking themselves serious questions about what exactly they were doing with their life. The smart money prior to kick-off was therefore on a dull game, in which the sheer weight of Spanish possession would eventually wear down a tediously resilient Paraguayan defence to score a late goal and win the game 1-0. For this reason (along with the residual bitterness still rotting inside me following England’s dismal exit from the competition) I didn’t mind that the table my mate and I had been allocated to watch the game provided a pretty poor view of the solitary, relatively small (by the standard of most World Cup bars) screen. Indeed, as the game progressed, it proved much more entertaining to watch the gathered Spanish supporters shriek and shout their team through the game with an enthusiasm that belied the tedium on screen, than to watch the match itself. This typically Latin effusiveness certainly enhanced the authentically Spanish vibe that pervades the Pinchito Tapas experience, but it was by no means the sole contributing factor. 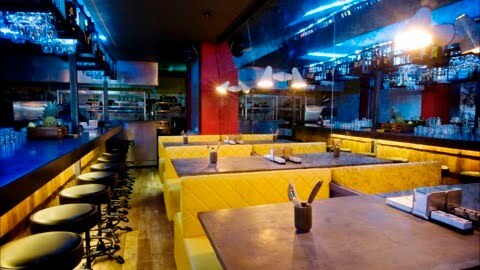 The bar/restaurant is styled in a modern, urban continental design that you are far more likely to see around the streets of Madrid than the tacky hotchpotch of flamenco imagery, bull-fighting memorabilia, stills from Almodavar films and other sundry clichés that usually bedeck the walls of Tapas restaurants in this country. The menu is varied and features dishes that are by turn distinctively Spanish and spliced with European and North African influences (the Octopus with Chorizo and Potatoes was a particular pleasure, definitely beating German soothsayer ‘Paul the Octopus’ into second place as best cephalopod of the World Cup). Even the weather was playing its part, with the Pinchito Tapas windows opening up onto a Bayley Street that was bathed in warm Spanish sunshine by day and balmy continental warmth by evening. By the time that evening crept into night, our spotless empty dishes were cleared away and the football long was a distant memory (a bizarre 60 seconds that featured three penalties – one miss for each side and a retake for Spain’s Xabi Alonso – had not rescued the game from the lacklustre1-0 late-goal-victory for Spain that was predicted). It was then that Pinchito Tapas’ strongest selling point came into its own. Award-winning mixologist Guillerme Le Dorner’s cocktails are as good as anywhere in London, with even the most common recipes like mojitos and sangrias given a unique boost. His Blazer – a Spanish brandy cocktail whose pyrotechnical creation (performed by Guillerme at our table) was as spectacular to watch as the end product was to drink – is a must-try digestif for every visitor. With Guillerme’s mix-mastery bringing the evening to a comfortingly fuggy close, Pinchito Tapas had proved a wonderful antidote to the anticlimactic atmosphere that the England team’s startling ineptitude had brought to most football-watching venues. A Tapas bar that makes even watching the best team in the world a mere side-show, Pinchito Tapas’ varied delights really helped provide a little perspective amid all the World Cup hype, reminding us that even for the most hardened football fan, there are so much more pleasant ways to spend your time in London than watching a bunch of arrogant, ignorant millionaires kick a ball round a field.